John Sadler offers One to One sessions with all ages and abilities. 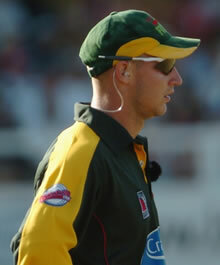 John is a qualified ECB Level 4 coach. John does most of his outdoor one to one coaching at Ossett Cricket Club. During the winter, indoor facilities are available. John is also available to travel to deliver coaching sessions. "I believe One to One coaching is a great way to spend 'quality time' with a coach developing basic and advanced cricket skills. With full use of the cricket square, the outfield and the nets, and with bowling machines available, we provide the perfect environment to practice and learn skills on a one to one basis." An hours One to One session costs £30. Video analysis is available for an extra £10 and you get to keep the video footage. Several Cricket Camps are available at Ossett CC starting at Easter right through to the end of the summer holidays and will again be managed & lead by John Sadler. John will also be running other camps at various cricket clubs in the Yorkshire area. These will range from basic cricket camps, covering all the fundamentals of the game for children and making the game fun, to more advanced specialist courses, concentrating on batting, bowling & fielding master classes. Camps usually run for 3 or 4 days depending on the type of camp. Cricket Camps are usually scheduled around half terms and school holidays. See Cricket Calendar for more details. During the winter months, we will be running coaching courses from September through to December, and January through to March. These courses involve a weekly, two hour indoor training session lasting 10 weeks. They will cover basic skills for all aspects of cricket including batting, bowling, fielding and wicket keeping as well as improving fitness levels. Regular net sessions and indoor games will also be part of the course to practice new and existing skills. With specialist professional coaches assisting specialist sessions, Winter Academies are an ideal way to either maintain high standards of a previous season, or to practice and improve new skills and fitness levels ready for a new season. View our Cricket Calendar or contact us for more details. Video analysis is an extremely useful tool to help you learn. It is an ideal way to see for yourself what your strengths are, or where you need to improve. When booking a One to One session make sure to ask about video analysis. John Sadler is available to coach at your club practice sessions, both senior and junior. He can lead sessions concentrating on specific skills and conducting specialised drills or simply assist the existing coaches and be available to give advice. Prices depend on where, when and how many players. Contact us for more details. John is vastly experienced. He has coached children of all ages in all environments including many schools. In 2011 he delivered the ‘Chance to Shine’ project to six different schools and will repeat this in 2012. If your school would like some basic 'Introduction to Cricket' lessons or a coach to run more advanced sessions, John is the ideal candidate. Prices depend on where, when and how many children. Contact us for more details.